Gary Speed wasn’t as naturally skillful as Youri Djorkaeff, didn’t score as many as Kevin Nolan, wasn’t as fast as Nicholas Anelka and certainly didn’t make as many headlines as his midfield colleagues Jay-Jay Okocha, Ivan Campo and Fernando Hierro. Yet the outpouring of feeling from my fellow Bolton fans online and on radio phone-ins shows how highly he was esteemed at the Reebok Stadium. He was a key part of the best team Bolton has had in more than 50 years and as such is part of a very special group of players in the minds of Bolton fans. Just look at the picture above. Can you imagine this guy being on the losing team very often? Supporters of Leeds, Everton, Newcastle and Sheffield United will have their own stories, as of course will all proud Welsh fans. But allow me to share a couple of my favourite memories of Gary Speed. Another great memory was the day Gary scored a lovely overhead goal during a 4-1 demolition of West Ham. Such a deft finish from a player who could do a bit of everything. He seemed to enjoy playing West Ham, because he put in another outstanding performance against them a few months later in a 4-0 thumping. That game marked his 500th Premier League appearance (a record at the time) and saw him completely boss the midfield. Wonderful stuff. Gary was into his late thirties but didn’t seem to be slowing down. In 2007, the team was not in good shape, but against all odds we went on a remarkable UEFA Cup run. The obvious standout results were the victory over Sergio Aguerro’s Atletico Madrid and the amazing 2-2 draw with Frank Ribery’s Bayern Munich. But in between those astounding results was one every bit as unlikely. With a depleted side we went to Serbia and became the first ever English team to beat Red Star Belgrade on their own patch. Among the youthful players helping us get the result there was an old head guiding play and seeing us safely home. Speed was outstanding that night. His record with Wales speaks for itself. 85 international caps is a superb achievement. More than 800 league games played and well over 100 goals scored is another massive milestone. This guy was the real deal. Not a ‘legend’ in the overused contemporary sense. But a true gentleman and a wonderful athlete. That his promising managerial career has been cut short only makes the tragedy of his early death all the more galling. There were signs that he’d be the man to bring Wales in from the international wilderness. And if that does end up happening at the next World Cup, Gary Speed will still have played an integral role. My memories are all Bolton-based but I’d love Leeds, Everton, Newcastle, Sheffield United, Wales and other supporters to share their stories in the comments below. Depression and suicide are monsters which stalk too many of those we love. If you’re suffering, remember there is ALWAYS someone to talk to. Ring the Samaritans – they really do care (08457 90 90 90). God bless Gary. Thanks for the memories. Spot on . 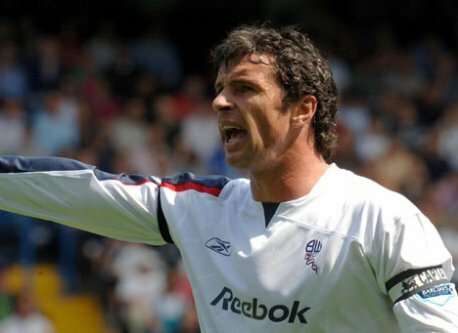 RIP Gary Speed.